Today's the day you've been waiting for! 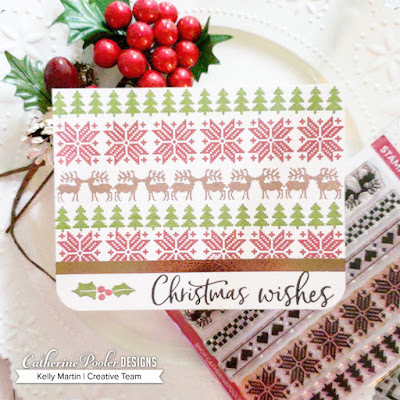 The new Stamp of Approval collection is now available for purchase over at the Catherine Pooler shop! You can very easily re-create this card that I'm sharing today, so let's get right down to it! Start out by cutting and scoring a 4.25 x 5.5 inch card base. Go ahead and decide what you're going to do for the sentiment now, because in order to keep this card one-layer, I had to mask off the bottom area for the sentiment right away. After I masked off the sentiment area, I used the Cozy Borders set and alternated the images and inks to create this background pattern. 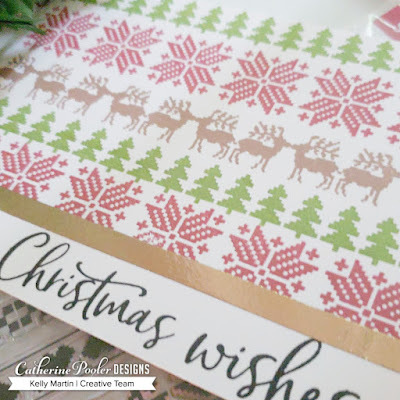 Once I was finished with the background stamping, I stamped a sentiment and then added a small image from the Festive Trimmings set. For a finished edge, I laid down a small strip of double sided tape right above the sentiment and then applied some foil over the double sided tape, using a bone folder to rub in the foil on to the tape strip. Thanks so much for stopping by and I hope you're heading over to the Catherine Pooler shop RIGHT NOW to go get your collection before they sell out!